My form can be found at http://www.jotform.com/?formID=23084514663150. I would like to have just one field for the Name instead of two, and it be the same width as the field for capturing the email address. How do I do that? You can use the common text box field for the full name. Check this topic on how you can resize the texbox fields to be all uniform. Please inform us if you have furher inquiry. How do I get rid of one of the default boxes? Right now there are two boxes side by side for first and last names. You can replace it with the single texbox found in the common tools. You can delete the field by clicking on the red x button. 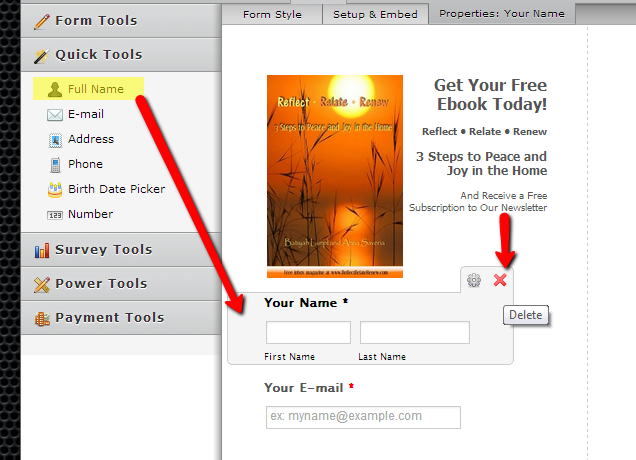 Please be aware that deleting fields in your form will also delete the submissions in your data that uses the deleted field. Thanks! I haven't made my form go live yet, so I don't have any submissions. But I'm glad I asked this NOW, instead of later. I've made the changes, and it worked great. Now I need to make the asterik next to Your Name red so it shows that it's a required field. How do I do that?